Rhubarb Cheesecake Recipes are a merging of rich cream cheese, and the sweet tart flavour of rhubarb. There are many different types of cheesecake recipes, all with unique tastes and textures, including rhubarb cheesecakes. A great idea for a dessert with rhubarb! I don't know about you, but I just LOVE cheesecake! The very name given to this popular cake, "cheese" almost seems to take away some of the guilt I feel when falling into the temptation of eating a slice of cheesecake! Cheesecake recipes vary from the easy and simple recipes with less calories, to the very rich, gourmet type of cake. Some cheesecakes are "baked" , and others are "no-bake" cakes. 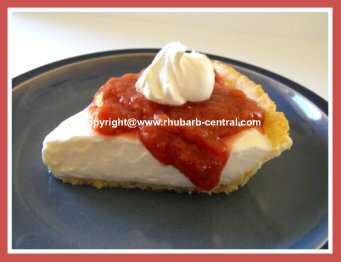 I have included a variety of rhubarb cheesecake recipes below. Easy Rhubarb Cheesecake (No-Bake) Makes 3! Here are some handy tips to help prevent Cheesecake from cracking when baking in the oven. ~ Do not over-mix the cheesecake batter after you have added the eggs. Eggs tend to "trap" air bubbles which may, in turn, cause the cheesecake to crack across the top surface of the cake. ~ Do not over-bake the cheesecake. The center of the cake should still be somewhat "jiggly" when it is removed from the oven. ~ Allow the cheesecake to cool as gradually as possible when it removing it from the oven. A sudden drop in temperature may cause the cake to crack. If your cheesecake does crack, simply add a garnish to the top! 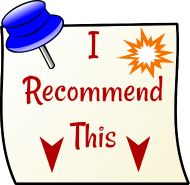 A garnish of fruit, fruit sauce or compote, or even a chocolate or caramel sauce. Not only will these garnishes enhance the look of your cheesecake, it will add to the flavour too!